National Guard Panther Racing driver J.R. Hildebrand takes over the instructor seat this week as the latest Online Driving Instructor. J.R.’s answers will be posted daily beginning Monday, September 10. The top-three questions will receive three-month iRacing subscriptions!! A National Merit Scholar and member of his high school’s varsity baseball team, J.R. Hildebrand was 14 before gaining his first taste of a go-kart at the Jim Russell School in Sonoma. Within a couple of years, Hildebrand had graduated to the school’s car racing series, which he won handily, then on to F2000. He won a prestigious Team USA Scholarship in 2005, dominated the USF2000 championship in ‘06, winning 12 of the 14 races, and continued his progression by winning the 2009 Firestone Indy Lights Championship. After making two IZOD IndyCar Series starts with Dreyer & Reinbold Racing in 2010, he signed with Panther Racing to drive the National Guard car and, agonizingly, finished second in the 2011 Indy 500 – earning Rookie of the Year honors – after crashing out of the lead in the final corner. 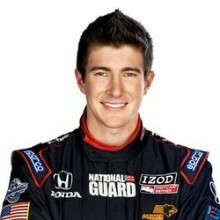 J.R. Hildebrand answers your questions! How big are your commitments outside the race car and do you have and/or would you recommend having a manager? Thanks, JR! I do definitely have quite a few commitments outside the racecar, largely team-sponsor related, but we all also do PR events for the series and manufacturers as well. It’s a big part of the job, but I personally only started dealing with it once I got to the IndyCar level. Because of that, I wouldn’t really say that you need a manager until you are getting to that point. Having someone available for legal advice so you can get contracts sorted out before that point is definitely a good idea, but I don’t think it’s necessary to have a manager until you are going to get paid as a driver. For me, working with my maanger has been a lot of fun, and I think that’s definitely helped us get more things accomplished. If you decide to go down that route, it should be with someone who understands your interests, values, and objectives. With less American junior formula series nowadays, do you think it would help or hurt to leave America and go overseas (for example, Formula Renault) if you wish to return to America to run a series like ALMS or IndyCar? My personal view is that racing in Europe is always a good idea, but it also requires a bit of forethought to make sure you don’t get lost over there. Being able to race on a level playing field is definitely a necessity, whether its Formula Ford, Formula Renault, F3, GP2, or whatever else it might be because that’s your best shot at staying top of mind with people – being competitive. If you can manage to do that, it will mean as much if not more to teams back in the states as if you stayed here in all likelihood. I’m 20 years old, I have no money and no real experience; all I have is a passion and a dream. I just don’t know where to start. How would someone like me make it into racing? Is it possible? It’s definitely possible, more difficult, but undoubtedly possible. I think a great way to start in this day and age is to get online driving a real simulated racing program like iRacing and work on all the fundamental techniques of both driving and racing. From there, with that basic knowledge of how things work, you’ll have to get out and feel it for yourself in a go-kart, really the most effective (and cost effective) way to continue to learn. You can do that in an arrive-and-drive setting pretty easily in a lot of places. Then you’ve got to be smart about where you go from there if all is going to plan. Scholarship contests definitely exist in racing, that’s something to keep an eye out for, for sure. Upon getting to a new track how long does it take to memorize the layout and know what speed you can carry into each turn? Memorizing a track becomes fairly natural over time, but getting it right in the car is a constantly evolving process. The more tracks you race on, the easier it becomes to look at a new circuit and relate the look of new corners to ones you’ve seen before, and have a general idea for what to expect. A lot of us practice a bit of visualization to get ourselves in the right mindset going into practice, qualifying, or whatever the situation might be. Really nailing it once you’re in the car is a tougher prospect because conditions are always changing and there are various aspects of a corner to consider and eventually get right or wrong. That invariably takes some trial and error, so you have to take some risks at first to get yourself in the ballpark, then re-evaluate where you’re at. Can you take another big swing at it, or are you pretty close and just need to chip away? The answer to that question can definitely get you into trouble if it’s wrong, but as a driver in that position, your primary objective is to reach the limit of the car as quickly as possible so that your team can get to work. So it’s a necessary time to be calculated, focused, and rather aggressive. At the IndyCar level, if you don’t have a fairly good handle on how to get around a new track by the end of the first session, you’re probably already behind, so it’s a big deal to get up to speed quickly. What is your fitness routine and what type of exercises/activities do you feel are most beneficial in driving a race car? Thanks! Fitness for driving a racecar is generally more difficult than normal sports because it’s difficult to simulate the forces that the body is under while driving without actually being in the car. I work out at St. Vincent’s Sports Performance Center in Indianapolis, and follow a fairly regimented fitness program there. The key elements to being fit for racing from a strength standpoint are core strength, upper back strength, and shoulder strength, while the majority of the cardio work we do is rather high intensity. Because of the nature of what we are dealing with in the car, we often combine some of them together to create difficult stability exercises or what might more generally be called dynamic workouts. Although it’s tough, I find rowing to be a particularly suitable exercise for getting fit for the car because it’s a very difficult cardio workout, but also works your upper back, core and arms all at once. How big was the adaption in going from shorter races to longer races over the course of your career and did you do anything to mentally prepare for this? I think up through Indy Lights the transition from shorter races to longer races was fairly seamless. Through that period my training programs adjusted accordingly to make sure I was fit for being in the car for extra time, but otherwise it was not a terribly difficult transition. Then when I got to the IndyCar level it was a big jump! Maybe even more so than the length of the race, you also have to deal with a couple of totally new elements; pitstops, fuel saving, etc. At first these things were definitely a little draining mentally because I wasn’t used to having to think about so many things while racing the car, so I prepared by visualizing good pitstops and talking to the team extensively to make sure I was very aware of everything that I might need to do during the race so I was prepared ahead of time. As a driver, how do you overcome the driver/engineer gap that many teams face? Do you have any tips to an aspiring engineer to help prevent any communicative issues between drivers and their engineers? The main concept to consider between a driver and engineer is communication. As a driver, you sometimes have to figure out what kind of feedback your engineer is going to want, and it can be a process to sort that out. Does he want to know what’s wrong, or what I need to make it better? These are the types of questions you sometimes ask yourself to work together more effectively. From an engineering standpoint, the best engineers I’ve worked with are ones that have some driving experience, so they can relate at some level to what you’re feeling in the car. 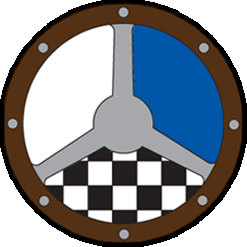 This is by no means a necessity, but in my view, a lead engineer needs to be able to make judgment calls without the assistance of a computer program, and in order to do that, you must have an understanding of the driving dynamic along with a broad perspective of the racecar’s setup as a whole rather than as individual pieces. Hi JR, thanks for taking the time. Aside from winning a championship, how do you know when you are ready to move up to the next level? Everyone tells me not to move up too soon. Good question. This is always tough to gauge I think. I guess it’s a combination of feeling like you have a very strong grasp and understanding for the formula you are currently in, and having the ability to compete at the highest level of that series, along with the confidence that you will be able to move up and not be overwhelmed. Biting off more than you can chew is a bad deal in motorsports because it stalls your momentum, and momentum is everything. Where do you start looking for those extra tenths? Anywhere you can find them, my man. A corner starts with braking, so you have to make sure you feel like you are getting that part of the equation right first and foremost. If your braking isn’t right, the corner probably isn’t going to be right, and there’s inevitably going to be some extra lap time available. That’s probably a general first step. 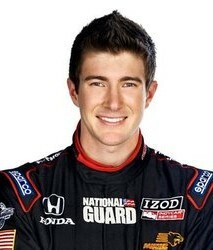 As a rookie you had such a great run at the Indianapolis 500. Even though it was disappointing it was so impressive for a rookie to run that well. What did you do to prepare for that race having never done it before? Did you watch any tapes or do any simulation? There are actually a number of things that played at least some small role in having a strong run as a rookie last year, some probably more than others. For starters, I just went into the month with a lot of confidence because I knew that my team would give me a good car. As far as I was concerned more personally, I think for sure having raced in the Freedom 100 twice was a valuable starting point for me, because I was already aware of some of the nuances of the track and the type of racing that occurs there. When I first got on track in the Indy car, I tried to quickly determine whether I needed to be trying to get the car to feel similar to how I liked the Indy Lights car and do the things I had wanted the Lights car to do, or whether the extra speed was going to sort of change the equation entirely. I had done a bit of driving on the computer to just get a feeling for the timing of turn-ins and so on; I feel like that’s one of the toughest things to overcome with any oval since the speeds are so drastically different than anything else we do. Beyond that, I really just tried to have an open mind about what was going on, and I tried to be receptive to what anyone had to say about how I was doing things while trying to maintain a sense of what I was personally looking for from the racecar. Maybe an even bigger key was that I (and we as a team) didn’t ever rush to find speed. We took it one step at a time, very methodically. That place will bite you in the backside big-time if you get ahead of yourself, so patience played a key role. While you have been successful climbing the ranks to IZOD IndyCar Series, many young and hungry drivers like myself lack adequate funding for a full racing season. Have you ever thought about funding a scholarship for American-born talent in a lower level series, possibly Star Mazda? It is definitely something that I would like to be able to be a part of at some stage. I do currently contribute to the Team USA Scholarship each year so I suppose that’s a bit of a starting point. For me personally, I think that investing in a team and trying to create a sponsorship situation that would help fund young drivers would be more likely my style. In that way I might be able to both help young drivers race, but have some equity in a program as well. What would you say is the most important aspect a young driver should know while looking for a sponsor? That’s tough because there are a lot of things to be aware of. I think something that every young driver should be aware of is that the most likely chance you have of creating a long-term relationship with a company is if that company in some way reflects who you are or vice versa. Along with that general concept, I would also advise that you can never overlook the value of meeting and presenting an idea or proposal to someone in person. Those two things together will give you a great chance to make a valuable connection. And if they turn you down or don’t get it, keep trying and keep an open mind. What is your strategy for negotiating hairpin turns? We have actually had a few hairpins this year to work on this, and one of the things that I’ve found to be particularly advantageous in terms of finding lap time is really maximizing the amount of entry speed you carry into a hairpin. In the Indy car, it’s very difficult to put power to the ground in a tight hairpin corner until the car is close to straight out of the corner, and even at that point you’ll still spin the tires some. So even though it seems like you can get the car straighter sooner by turning in late and apexing late, that doesn’t end up equating to much additional exit speed because you still don’t really end up being able to get to full throttle until you’ve gotten your hands almost entirely freed up out at the edge of the track. So instead we have found a noted gain in turning a bit sooner and carrying the deceleration into the corner, using the scrub created by the act of turning even to some extent, to basically get from Point A at the entry of the corner, to Point B where the car is straight and full throttle can be applied at the edge of the road a tenth or two quicker. I’d draw it for you but I’m not quite that handy with just a keyboard. In lower horsepower cars, that is probably slightly less of a necessity, but still certainly something to try if you find you’re lacking a bit of pace. Do you prefer ovals or road courses and why? I really enjoy them both. I find the racing on ovals to be very exciting and challenging as a driver, and the grip and speed that an Indy car can produce on a road course to be very much the same. It is probably more track dependent, and probably a little setup dependent, too! Driving a car that isn’t working for you is pretty much never much fun no matter how great the track is. If I could pick five tracks to race an Indy car there’d be a mix of both. Probably Road Atlanta, Indy, the REAL layout of Sonoma Raceway, somewhere fast and different like Pocono maybe, and Mosport. I like fast corners, what can I say? J.R., having experienced everything you have, and understanding what you do now, what do you think is the key to making road racing in America successful? Another great question. This is always a bit of a moving target in my view, but on a personal level I certainly have some thoughts. The first concept that I think needs to be considered is the value in pushing technological limits. The rate at which technology (in a general sense) grows is increasing faster than ever before. I think it is important for road-racing in particular to not lose sight of the necessity to embrace that and be on the tip of the wave at least as it relates to the automotive industry. It is my opinion that we cannot allow high level road-racing series in the U.S. to become outdated. I also believe firmly, going along with that, that we need to be going faster and pushing for tracks to improve safety to allow that to happen. We are at a point where the performance of the cars is limited by the safety of the track in many cases, which to me is a distinct issue for both of those reasons. I have been karting for three years now and my dad got me a 1983 F2000 Van Diemen. All it needs is another gas tank (bladder) and seat. To get started driving is it just a matter of lots of practice? Practice certainly makes a big difference, but I would recommend attending a racing school to learn the truly proper techniques to driving a full-size racecar. Karting will teach you a lot about how to approach different types of corners, and especially how to race, but there are a lot of new concepts that you will have to deal with driving a racecar with suspension that will be very new. Racing schools can make sure that you have good habits right from the start which will make your practice much more effective. You started karting at the age of 14; how difficult was it for you to pursue their racing career with such a late start (compared to other drivers who start racing before they can walk)? You make a great point. I was very fortunate that the Jim Russell Racing School had a very effective ladder system within the school at the time that I got started. I won my first karting championship with Russell when I was 14, participated in a three-day school as a prize for winning that championship, then after a year in junior 80cc shifter I won the Russell Graduate Runoffs in the big cars. That then allowed me to graduate to the Russell Championship Series which I won the following year. The whole program accelerated my growth in a very controlled and effective way, making it possible to make up for the fact that I had not actually been racing for very long by the time I got into a full-size car. That also got me to a point fairly quickly that I – and maybe even more importantly, my parents – could see that this whole racing situation was actually going somewhere! What has been the hardest hurdle you have had to overcome in your racing career? Well the hardest ACTUAL hurdle I’ve had to overcome was the one that I twisted my knee on last year that tore my ACL! All joking aside, 2011 in general was very taxing both mentally and physically. Between Indy, tearing my ACL, then the tragic accident in Las Vegas, I was definitely at a crossroads by the end of the year. Not any one of those things specifically weighed on me enough to really become a dire issue, but the three of them combined made for some long nights. I quickly realized that they were beginning to affect my mental attitude about things even beyond racing, and at that point I knew there was really only one option. I had to accept all the things that had happened at that stage, and that process was actually very reassuring because I was able to assert for myself that this is, in fact, exactly what I want to be doing. Through that I learned that sometimes things that are perceived as negatives can be a means for reflection that help you out down the road. First off, Go Niners is right! The ole red and gold is looking pretty good this year. As far as in-car adjustments go, the only time that I am frequently changing things is on ovals. On a road course you basically have three tools at your disposal: anti-rollbar adjuster(s), brake bias, and engine/throttle maps. These are rarely things that I adjust constantly throughout a lap; they are generally tools that I’ll incrementally adjust over the duration of a tire/fuel stint. On an oval however, we have an additional tool in the weight-jacker. I find that there are definitely times where I am constantly adjusting the weight-jacker along with the roll bars to find the right combination of settings to make the car work at one end of the track or the other. It is also frequent that conditions for Turns One and Two are different than Three and Four at a given track due to shading on the track, wind direction, or banking. This can sometimes warrant twice-per-lap changes to adjust for the different ends of the circuit. What advice would you recommend to an aspiring driver (20 years old or older) to be able to try and be able to make it up to a big name series such as IndyCar or Grand Am among others? I think the two most important elements of making it to a high level in motorsports are smart decision making as it relates to the teams and series you race with along the way, and having perspective about where your career is going. Winning races is an inevitably powerful means of climbing the ladder in motorsports, and the best way to do that is by racing with top level teams in a series that suits your experience. All too often drivers skip a level along the ladder and get in over their head, significantly stunting their ability to compete. When I say having perspective, I mean that in the sense of understanding where you are at and the other variables in play (sponsorship, exposure, etc.). These things can have a significant effect on one’s ability to continue to race, making it even more important to be smart about the cars and series out there. In a general sense, as long as it’s financially possible, driving a variety of cars to gain the experience of different things is also a good move. What were the biggest differences between a F2000 car and a Jim Russell car? Which one was more difficult to drive and why? Well this one is a little tough for me to answer to be honest because the Russell cars (carbon chassis/turbo four-cylinder) now are a lot different than the Russell cars when I drove them (tube frame/Mazda rotary power). At the time I was driving I found the F2000 car to be notably more refined than the Russell car, really forcing you to be more sensitive with your inputs and placement of the racecar. I think the Russell cars now are similar to an F2000 car in terms of their handling characteristics since the tires and size are fairly similar, but the power delivery is vastly different. The turbo four-cylinder motor in the Russell cars, when turned up, make for a lot of difficulty putting the power down in comparison to the F2000 car. In a general sense, I firmly believe that the F2000 formula is one of the best out there to learn and grow as a driver at an early stage. What are the qualities of an elite race car driver? I think most drivers at a high level in motorsport have a few specific things in common. The first and most universal similarity is the drive to compete and the drive to win. Secondary to that is the confidence that they can achieve that. Beyond those things, I’d say that most drivers at a high level are all calculated risk-takers, and in a more generalized sense have a strong sense of mental fitness as it relates to quick decision-making. Hello Mr. Hildebrand. My question for you today is: how does a future racecar driver prepare to be in any series without having a major go-karting background? I am currently attempting to gain my experience from NASCAR and road racing schools in my local area. However, I am a college student with a small income. In the long run, what advice can you offer to help those of us who would need a racing scholarship to help with this exciting career? Thank you. I think that understanding your financial situation, as it seems as though you have, is a key ingredient to making the right decisions moving forward. It is my belief that gaining driving experience whether through club level karting, SCCA or NASA racing in a modified street car or, believe it or not, online gaming, can get you to a point where you will be able to make the most out of a school-based racing series like Skip Barber or Jim Russell. That then puts you in a position to potentially benefit from scholarships to help you achieve your goals of moving up through the ranks. If there was one piece of advice concerning, or knowledge pertaining to, the lifestyle of being a professional racing driver that you wish you would have known at the beginning of your career, what would it be? Thanks for your time! Great question. I think that it’s definitely possible to be blindsided by the time commitment that is required to appease sponsors, manufacturers and other entities, but I also think that is generally ingrained in drivers from a young age in this day and age. For me the element that I wish I had realized played a significant role earlier on is how much the driver becomes an integral part of everything that the team does. When they hand you the keys to the “big car” as we call it, you also assume a lot of responsibility, much more than at any other level before that. That was the most difficult thing to adjust to for me when I got to the IZOD IndyCar Series.